Proudly meat free. Satisfyingly simple. High in protein and fibre. Gluten Free. 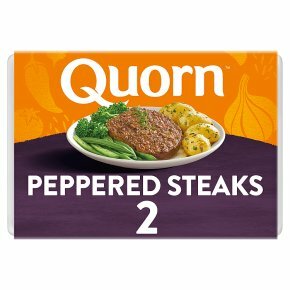 Vegetarian Society approved.Deliciously succulent Vegetarian Peppered Steaks are seasoned with cracked black pepper. Great for a tasty midweek dinner served up with chunky chips and grilled tomato. Remove all packaging.For best results Hob cook.All appliances vary, these are guidelines only.Check product is piping hot before serving. 6 minPreheat 1 tbsp of oil. Fry over a medium heat, turn halfway. 12 minPreheat oven to 200°C/Fan 180°C/Gas 6.Brush with a little oil. Place on a baking tray.Cook on the middle shelf. If cooking from frozen, cook for 18 minutes.